Father Chris Harper talks about bridges a lot. It’s probably because he’s had a foot in two worlds his whole life. 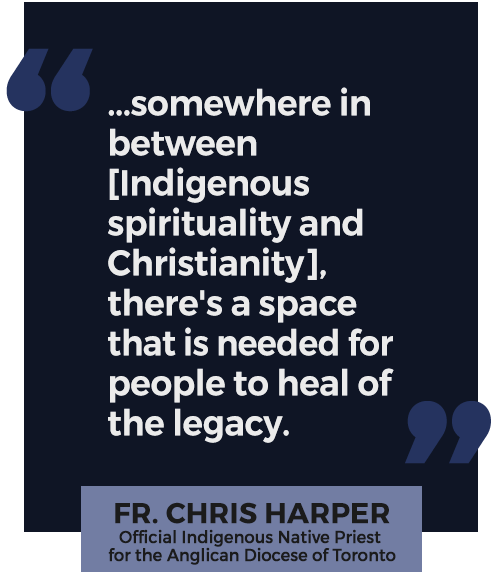 In September 2016, Harper was appointed official Indigenous Native Priest for the Anglican Diocese of Toronto, charged with providing religious services and pastoral care for all of Toronto’s tens of thousands of Indigenous people. “I’m trying to find the Indigenous people,” he says. “It sounds weird, doesn’t it? In a city this size, trying to find where the Indigenous people are and trying to hear their voice and their cry for what kind of form and shape of ministry needs to happen within the near future.” While his predecessor, the retired Rev. Andrew Wesley, focused (and still focuses) on street ministry, Harper is taking that ministry in a different direction. Phase one: touring Toronto’s Anglican churches and filling them in on everything from the church’s history with Indigenous peoples and the residential school system to the missing and murdered Indigenous women and the Truth and Reconciliation Commission’s calls to action. Phase two: establish some kind of permanent, stable worshipping community or parish for Indigenous Christians, with forms of service reflecting their own spirituality which can be used across Canada. Harper, who is Plains Cree, grew up on a reserve in Alberta in a “wonderful conundrum” of traditional Plains Cree cultural and spiritual practice mixed with regular attendance at Sir Geoffrey Paul Memorial Church. After working in a series of jobs ranging from ambulance medic to entrepreneur and lecturer, he was volunteered by his family to read Scripture at one of the declining church’s increasingly rare services. “Before I knew it, I ended up being a lay minister-in-charge.” Wanting to know what he was talking about, he started studying theology part-time, and when his bishop suggested that he actually become a priest, he did his Master of Divinity degree at Toronto’s Wycliffe College. His first parish assignment? Serving as incumbent priest for three rural churches, plus part-time work at six others: that’s nine churches for 10 communities on and off-reserve. Although few in number, there are other places across North America where Christian churches are working with Indigenous ministers and communities to allow them to worship in their own traditional ways. A lot of Harper’s job involves listening, even (and especially) to people who see him in a clerical collar and call him a traitor to his face. “They need to express [their anger], they need to get it out, they need to see it with their own eyes.” Part of the trick, he says, is remembering, as a priest and therefore a professional talker, to “shut up” and let other people tell their stories.